We offer concrete staining in Kansas City and for areas around KC. 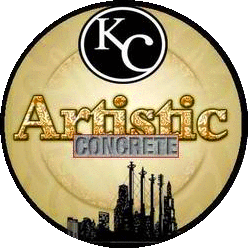 KC Artistic Concrete provides Kansas City concrete staining for KC and the metro areas. Each concrete surface will accept the stains differently based on chemical makeup, age, porosity, mix design, texture, ambient conditions and initial color of the substrate. The stains react chemically at the surface, penetrating and leaving unique permanent color effects. This is a stain, not a film coating; it will never peel, crack or chip. If your concrete is damaged, an overlay may be needed to achieve a clean canvas, followed up with one of many concrete staining options. There are generally two types of stains; acetone based dyes, and water based stains. Acetone dyes react with lime in the concrete forming a permanent stain that is highly durable. Every slab of concrete is different and therefore accepts the stain differently. This means that colors vary from slab to slab making each job unique. Acetone dyes come in about 12 different colors which are generally earth tones. In order for the concrete to receive an acetone dye it needs to be completely clean and free from sealer. Most concrete stains are usually sprayed down in an inconsistent manner. Different techniques such as rags and mops can be used to achieve more creative effects. Acetone dyes provide the customer with more vibrant colors as well as more control of the final color. These stains are great for floors that require a more consistent color, but can also have the mottling effect if so desired. This stain has the most versatility and vibrancy, and is much less time consuming to apply. Water based stains are also increasing in popularity largely in part because of the health concerns as opposed to other Kansas City staining methods. Water based stains are also more user friendly. Stains are generally sealed with high quality sealers and are followed up with floor waxes.